Is this ‘features’ had been applied @ been Implemented…? Not sure to understand the question. 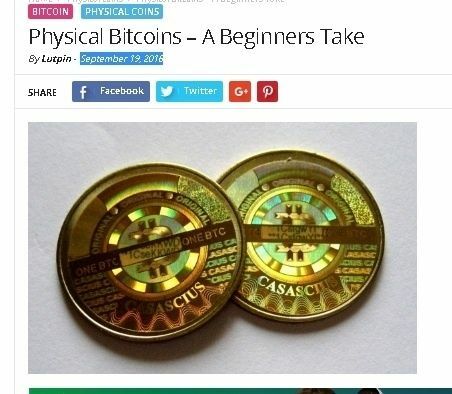 If your question is: physical bitcoin do exist ? The answer is yes, BTCC did it, called “BTCC Mint”. The particularity is those are fresh mined BTC, so without any history on the blockchain. Kind of cool. -the goverment of China is started to ‘banning’ the ‘ICO’ thing, is it…? not the whole crypto-scene, rit…? It hurts so much to read you, when you wrote this way. The aim of crypto-currency isn’t to be gov-resistante? Some guys spread false news, about China closing exchanges, this result in a big dump (about 3kRMB very localized on China market), so some guys just did big monney on some naive dudes. This is free market, so every think is normal I’ll say. again, thanks for reply. so, just ‘hodling’ and be a ‘strong-hand’ then ehh…?